Pedro vaz Pinto sent his usual trimestral report to African Indaba – this time covering the dry season. In July, the grass is long dead and burnt, visibility is at its maximum and the Palanca team can reach the most remote corners. Come August, Giant Sable tend to be tamer than during the rest of the year, females proudly present their calves, as they come out into the open to graze on fresh growths. By end of August and early September regenerating Brachystegia and Geophyte brush Miombo landscapes with vibrant and unexpected colors and the first showers bring back the earthly odors and myriads of flowers covering the Anharas. Vaz Pinto reported positive developments from Cangandala; Giant Sable seem to be grouped in at least three different herds, often splitting temporarily in different subgroups. With only a few tagged or collared individual females, and only one active tracking collar, it was difficult to determine the number of new calves at the end of the calving season. In late September the team asserted that rutting activities went well, with the huge master bull jealously herding and guarding his females. The team could closely observe rutting behavior. One interesting observation was that the main herd would often split in different subgroups without any seeming logic – calves would sometimes stick together and without respective mothers, or some would go with other animals and some would stay. 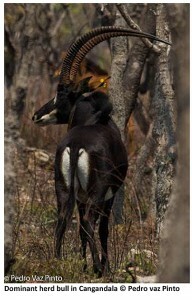 In a different herd the team observed a 3-year-old bull, almost black in coat coloration. There was, however, no trace of the old master bull, sometimes called ‘Ivan the Terrible’. Vaz Pinto reported that Cangandala Park management has improved over the latest months, and the rangers seem to be more motivated. Some repairs have been conducted on the Sanctuary’s fence, and finally the water hole is fully functional and widely used by animals. The reports from the Luando Reserve are unfortunately not as positive with an escalation of poaching in evidence. Apparently, poachers are using for the first time steel traps with toothed lateral faces and powerful spring coils. These traps can break the leg of a large antelope. Vaz Pinto’s team member Sacaia and two other Giant Sable shepherds came across one of these traps in dramatic fashion. While on a routine patrol along the drainage line used by the most important Giant Sable herd in Luando, Sacaia and his mates noticed suspicious tracks around a water hole. Apparently a Giant Sable cow had been caught in a trap and had been fighting for her life a few days earlier. While they were analyzing the spoor and looking for snares, Sacaia inadvertently stepped on a foot trap. In that split second when Sacaia felt the trap under his foot, in lightning quick reaction he lifted the foot. Nevertheless, he was caught squarely half-way through his brand new boot! If it had hit the ankle, the powerful trap would have broken the bone, but luckily the boot was able to absorb most of the force. With the quick support from his colleagues, they were able to disarm the trap, and in spite of the pain and injuries Sacaia was able to walk back home. If he had been alone he probably wouldn’t have made it. But at least one Giant Sable females of the main herd, wasn’t as lucky. A few weeks later, and near a different village, another group of shepherds also recovered a foot trap. From the animals collared in Luando in 2013 only two big mature bulls still had active signals and were being regularly tracked. One of them, a very old bull of around 14 years limped from a deformed hind leg caused by a snare; the second bull was in its prime – around 9-10 years old. For several months the team suspected that they had died, but it hadn’t been possible to reach the sites where they were thought to be located. Iin the dry season, the team did reach these sites, and found the skeletons of both bulls. The older bull was probably in poor physical condition and his teeth were much worn-down. It wasn’t possible to find any clues to shed light on what caused his death. It may have been from a poaching incident, but it may also as well have been from natural causes. Although this bull was apparently non-breeding for a while and irrelevant for the population, it was a sad discovery. The younger bull, an apparently dominant and healthy individual, probably fell victim to poachers. In his right scapula (shoulder bone) a round hole almost surely caused by a bullet was discovered. Moreover other poacher signs were abundant in the area. His loss is a huge setback as he was the dominant bull that attended both our second and third herds in Luando. Both bulls carried perfectly looped horns that measured 58 and 59 inches respectively. 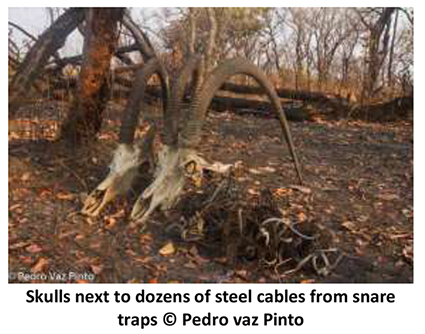 During the field trips in Luando the team found plenty of steel-cable snare traps, old and active poaching camps, and remains of animals – mostly duikers, either being smoked in racks at poaching camps, or simply rotting in the bush. The team also received some interesting news from our old friend the lion (see issue 11-4 of African Indaba for articles and photos). The latest news of this particular lion male, by now a living legend, was as colorful as before. Apparently this lion is on active anti-poaching control. He was reported to have killed and eaten a second poacher now! This time the story was that a pair of poachers was operating snare lines near the Kwanza River, when at night one of them decided to check on his traps while his colleague stayed in the camp preparing bush meat. Not only did the first guy never return, but throughout the night the lion was very vocal, roaring from the direction the poacher had disappeared. The following day, the second poacher made no attempt to look for his mate, crossed the Kwanza and told his tale. Download Pedro vaz Pinto’s interesting photos here.